DBT (Dialectical Behavioral Therapy) is a proven treatment for suicidal and self-harming adolescents, borderline personality disorder, and individuals who have multiple, complicated and serious mental health conditions. Rathbone & Associates practitioners have in-depth training and significant experience offering this specialized service. Rathbone & Associates offers fully comprehensive DBT as it was designed to be delivered–with all 5 modes: specialized individual therapy, DBT skills group, out-of-session telephone coaching, consultation to the environment, and consultation team. Team leader Britt Rathbone is a DBT expert, conducting trainings for providers locally and nationally on the treatment and leading an expert in-house treatment team. He is among the first therapists in the world and was the first therapist in the metropolitan DC area to be certified by the DBT-Linehan Board of Certification as a Certified DBT Clinician. This is the only certification approved by the treatment creator and is the gold standard for DBT competency. 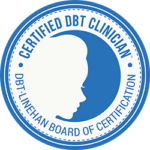 Other certifications (“DBT-C” for example) are obtainable solely by attestation and without the rigorous examination, review of clinical competence and expert review of videotaped sessions required by the DBT-Linehan Board of Certification. Mr. Rathbone is the coauthor of DBT With At-Risk Adolescents: A Practitioners Guide to Treating Challenging Behavior Problems (New Harbinger, 2014) and Parenting a Teen Who Has Intense Emotions: DBT Skills to Help Your Teen Navigate Emotional and Behavioral Challenges. Rathbone is a founding member of the Metropolitan Washington DC DBT Consortium. The consortium is committed to providing high quality dialectical behavior therapy. Additional information about DBT can be found here, and more information about adolescent DBT program can be found at www.DBTteens.com.